Who Really are the wealthy ones? Despite our economic wealth, we Westerners are steeped in our own form of poverty, one I rarely see in Nepal. Whereas the Nepalese people want for economic betterment, we are suffering an emotional poverty borne of our loss of true community and belonging. We have all the material comforts we can buy, but our mental wellness and wellbeing is being harmed by a lack of genuine human connections and a feeling of being displaced within our communities. According to research by Ed Diener and Shigehiro Oishi, poorer people not only tend to be happier, depending on what measure you use for happiness, but they also see their lives as more meaningful – as having focus, direction and principles. By contrast people with money – in this case Westerners – tend to seek immediate personal gratification above those qualities. The statistics speak for themselves. Look at the one-in-three divorce rate, the fact that one in five Australians drink heavily and rising illegal substance abuse and you will see a society that doesn’t seem at all interested in permanence. Rates of mental illness in Australian society are soaring. Youth suicide rates in Australia are the highest in the world. The Australian Institute of Family Studies has also identified a rising trend in single dwelling households and while some may see this option as providing increased personal freedom, there is concern that such fragmentation of family and community groups is leading to a rise in loneliness. These trends are mirrored in other English-speaking and European countries. Developing Asian nations have some of the lowest single dwelling rates in the world. This is certainly what I witness in Nepal; though poor, the people there are happy, connected to their families and very loving by nature. Perhaps when it comes to our priorities and the way we live our day to day lives, the wealthy Westerners and impoverished Nepalese can really learn a lot from one another. We in the West can embrace closer community ties and live less materialistically and the Nepali people can benefit from education and expansion through exposure to meaningful tourism. That is what Seven Women is hoping to achieve through our tours, a chance to make this cultural exchange in a responsible way. Stephanie Woollard is an award-winning Australian social entrepreneur and speaker who believes that a far more tolerant and compassionate world is achievable in our lifetime if we each take steps to make a difference. Stephanie is also the author of ‘From a tin shed to the United Nations’. 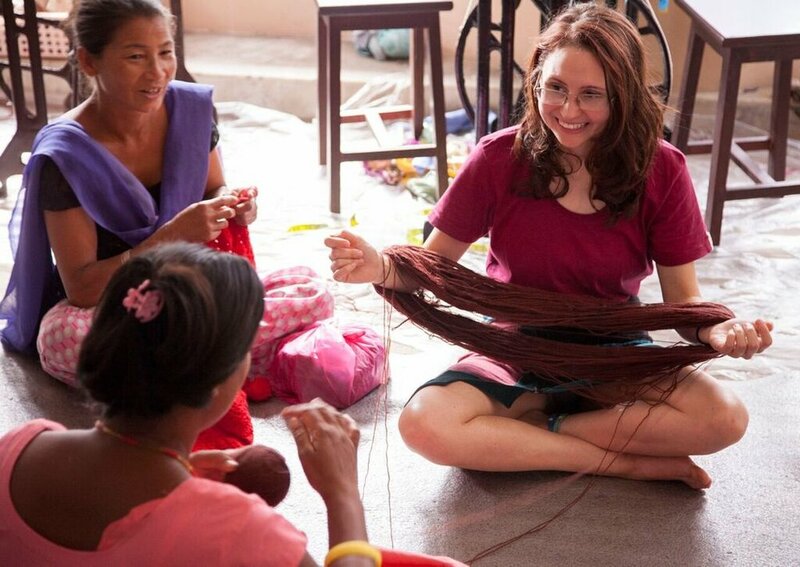 She has founded several enterprises with social impact: the aid organisation Seven Women, the Kathmandu Cooking School and the tour company Hands on Development. To find out more information visit www.sevenwomen.org and www.handsondevelopment.com.au.